The capital of Tatarstan is reaping the rewards for its investment in sports facilities as it now attracts prestigious international competitions. Looking out of the car window, I cannot help noticing how fast Kazan is being rebuilt. State-of-the-art sports facilities are sprouting up everywhere, even along the road leading from the airport to the city centre. The speed of development is being driven by the Universiade, or World University Games, which will be hosted here in 2013. Tennis great Marat Safin, a former world number one, Grand Slam winner and now a vice president of the Russian Tennis Federation, took me on a tour of the city’s sports venues, starting with the Tennis Academy. It is a 20-minute drive from the centre, provided there are no traffic jams – which seem to be frequent. “This is because of the numerous construction sites and road works that are being carried out in preparation for the Games. Let’s hope the traffic jams are temporary”, Safin says. The Tennis Academy is impressive, indeed. A giant yellow ball sits atop the long, slightly curved roof, as if bouncing off a giant racket. Not only does the new 85,000-square metre (102,000-sq yd), 3,200-seat sports complex meet world standards, but, according to International Tennis Federation president Francesco Ricci Bitti, it also “exceeds” the international requirements. It has already hosted many international competitions, including the Davis Cup, Kazan Kremlin Cup and the Tatarstan Open. “Moscow would also benefit from such a centre but it is the only one of its kind in Russia,” says Safin. Kazan’s sports facilities are not concentrated in one place but scattered around the town to make them better accessible to people. That said, there is an “epicentre” – the University Games Village, situated next door to the Tennis Academy, which has many sports facilities including a brand-new swimming pool. We meet Rafis Burganov, Tatarstan’s youth, sports and tourism minister, who says: “Kazan hosts a lot of sports events, and it’s very important for us not to be mere spectators but to practise sports actively ourselves. I see this as our main goal, rather than putting Kazan on the map as a sports capital. Indeed, Kazan’s local teams are already doing well. In addition to the success of its ice hockey club, Ak Bars – twice winner of the Gagarin Cup – its football club FC Rubin and its volleyball club Zenit Kazan are teams that play to full houses, and are all increasingly assertive on an international level. As with Olympic Games stadiums, the Universiade legacy requires that all facilities created for the game should continue to be used appropriately after the competitions are over. The facilities will be used by the local community, especially by local students. Kazan will also host some matches in the 2018 World Cup at the stadium being built for the Universiade. So, the 100,000 tourists and fans expected from 170 countries for the Universiade will have some exceptional sightseeing to look forward to in between the competitions. In two years’ time, Kazan will host the 27th World University Games, or Universiade (which takes its name from the words “university” and “Olympiade”). From July 6-17 2013, more than 13,500 sportsmen and women and members of delegations from 170 countries – plus about 100,000 fans – are expected to come to the competition. Aged between 17 and 28, all competitors are students in higher education, post-graduates and graduates from up to two years preceding the Games. More than half the athletes are also Olympic competitors. The event, which takes place every two years, is second only to the Olympics in size and significance. Russia has hosted the University Games just once before, in Moscow in 1973. 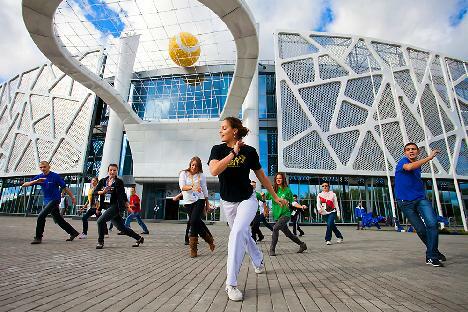 The Games in Kazan will set a record for the number of sports contested, with competitions in 27 separate disciplines. As well as track and field athletics, swimming, football, boxing, tennis and volleyball, five other sports have been included in the program for the first time: chess, badminton, belt wrestling, the Russian martial art of sambo, and rugby sevens. Russia is hoping that the Universiade in Kazan will be a successful prelude to the 2014 Winter Olympics in Sochi.